Itsmyivory, under jockey Jose Alvarez, winning the $100,000 Heritage Place Juvenile Stakes for two-year-olds Saturday at Remington Park. OKLAHOMA CITY, OK�JUNE 3, 2017�Itsmyivory remained undefeated in three lifetime starts after a driving half-length finish in the $100,000 Heritage Place Juvenile Stakes for two-year-olds. After an alert start, the wagering favorite at 3-2 odds, edged away to earn $25,000 for winning owner and breeder Bobby Cox of Fort Worth, Texas. The gelded son of IVORY JAMES, from the Bag (TB) mare Itsmybag (TB) covered the 350 yards in of 17.576 seconds over a fast track. Itsmyivory is trained by Josue Ponce and won under the hands of jockey Jose Alvarez. Itsmyivory paid $5 to win, $3.40 to place and $3 to show. Aqua Girl led in the early going, but yielded midway to pay $14.60 to place and $6.40 to show. Lady Eagle 123 checked in third, 1-1/2 lengths behind the winner, to pay $10.40 to show. Itsmyivory has now made $35,584 overall. The Heritage Place Juvenile is for 2-year-olds who competed in trials for the $1.1 million Heritage Place Futurity but did not qualify for the lucrative final. 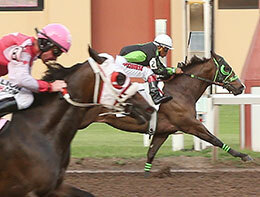 Also on Saturday, Nymeria won the Grade 1, $1,154,700 Heritage Place Futurity at Remington Park. Bred by Bobby Cox, the 2-year-old Bigtime Favorite filly is out of the IVORY JAMES mare Havanah Goodtime. Also trained by Ponce and ridden by Alvarez, the Grade 1 filly is owned by by Alfredo Garza of Anthony, N.M.